Happy Friday! I’m arriving here a bit tired after a fun-filled evening out with some friends last night to celebrate birthdays. We sat at a round, corner table upstairs at Epic Chophouse in downtown Mooresville and laughed for several hours. It was wonderful! It is funny now to look at a menu through a plant-based lens (and yes, I know we were at a steakhouse), but still, eye opening. 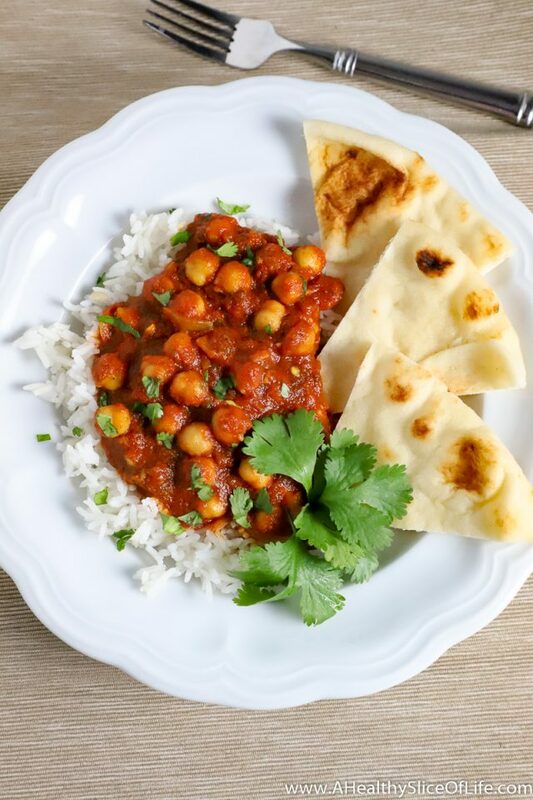 Not to be confused with meatless, meat-LESS is going to be my food focus for March that focuses on incorporating more meatless meals without necessarily eliminating meat altogether. I’m hoping it will be a fun exploration into more plant-based eating for anyone curious about trying it. I’ve enjoyed this journey so much and am learning a lot along the way, trying so many new foods and recipes, and receiving a lot of feedback about how much you are looking to do more plant-based for your families too. So many of you have sent me incredible suggestions and tips, so I’m going to be doing more meatLESS meal planning, sharing of favorite kitchen tools and tips, and also highlighting some of the wonderful resources I’ve discovered with you help. I’ll be sharing meals on Instagram, too, using the hashtag #AHSmeatlessinmarch. If you have any favorite plant-based meals, resources, cookbooks, food products, or cookbooks you love, please add this hashtag to your post so I can check it out! We’ve talked about going camping every year but still have yet to go with the girls in a real way (our only venture was when we went camping on Lake Keowee THREE years ago). This year we are determined to make it happen. We are looking for a car camping spot within a short drive from Charlotte. We’re considering South Mountains State Park (because we enjoyed our hike there so much), but are open to other suggestions too. Local friends- is there anywhere you would recommend?? You know how once you start to focus on something, suddenly you see it everywhere? That’s how I feel with homeschool lately. 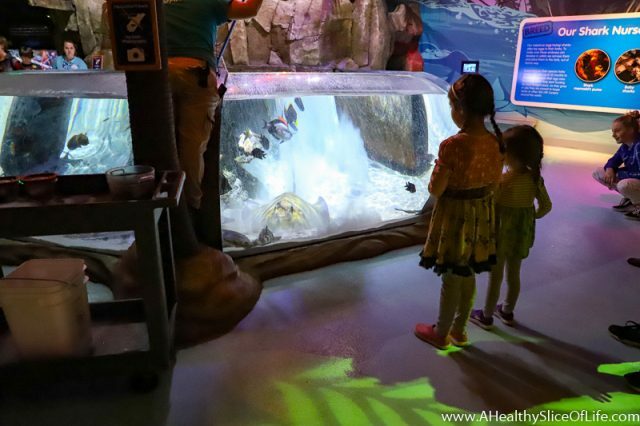 I’ve met more homeschooling families nearby, I’ve become aware of more events geared towards homeschoolers (like the Discovery Place science classes), and we’ve found extra curricular activities that take place earlier in the day specifically for homeschoolers. We just joined a Wild + Free group and Hailey just signed up for a gymnastics class that has 7 other girls her age that all homeschool. That means I now have that many more homeschooling moms to know! It’s great. Seven months in, though I don’t feel I have it all figured out by any means, I do feel really comfortable in this role. It is such a great fit for our family at this time. 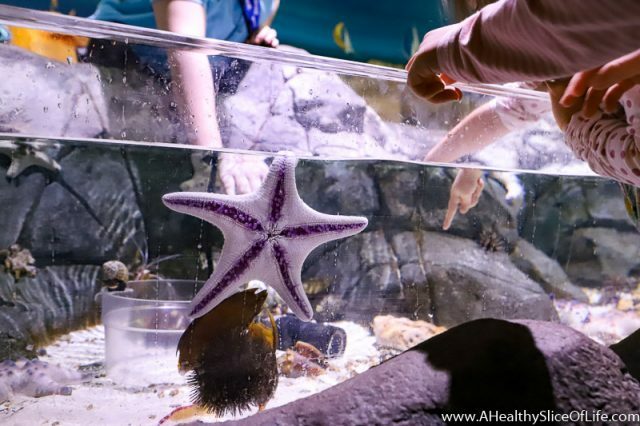 On Wednesday we attended Homeschool Week at the SeaLife Aquarium in Concord. They have these twice a year and offer discount pricing and specific activities set up for homeschooling kids. It was a BLAST! 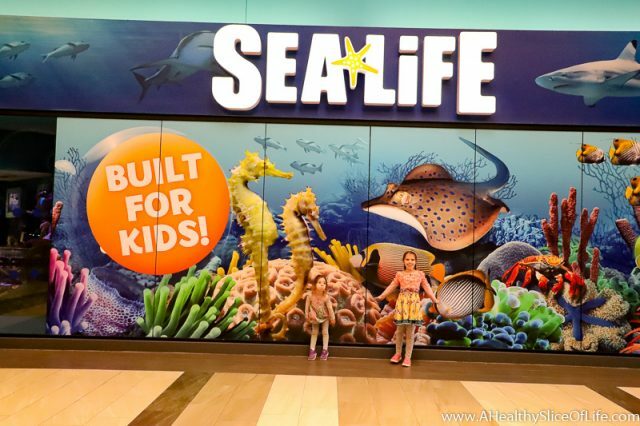 The girls loved it all, from wandering the aquarium, to seeing the stingray eat lunch, to meeting the baby shark that just hatched that morning, to even getting to go on a behind the scenes tour to see how they clean the water and more. I picked up a new matcha tea latte mix on a recent Thrive Market order. 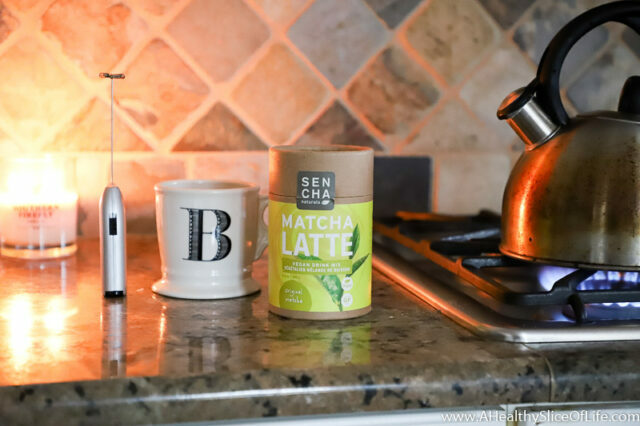 You can read more about the benefits of matcha tea here, but in short, it’s different from other teas because you consume the entire leaf (which is ground into a fine powder). I’ve tried it before, but the strong taste was a bit much for me, and on a whim I decided to try this latte version. It has coconut sugar to sweeten it, along with coconut oil and algae flour, which made it palatable (even enjoyable), but what really has sold me on it is the way I feel after I drink it. Coffee tends to give me a quick energy burst (and the shakes), but then leaves me feeling crashed and more tired than I was to begin with. I’m finding the matcha lattes give me a more gentle lift and an alertness that stays more stable throughout the day. I’m hooked for now and will be buying another batch! Also, my frother is from Ikea, but if you’re after one, this one is a great option! What Changed This Teacher’s Mind About Homeschooling – I’m not really interested in convincing anyone else on our family’s choices, because a “right” choice can differ so much based on unique circumstances, but I do feel like this article offered a nice peek into some of the benefits I’ve seen in making the choice to homeschool. Honestly, I feel that if parents are invested in their child, they will thrive in almost any educational setting, but as someone who is occasionally on the receiving end of eye rolls and judgement, I think it’s nice to read a positive perspective from a former skeptic. The Mistake I Made With My Grieving Friend – This article gave me so much to think about with how I react when speaking with anyone on a range of subjects. I’m often quick to add in my own story, in hopes of creating a “me too” connection, but honestly that isn’t always helpful and this article was a gentle reminder of how I can do better with creating supportive responses. I find Jen’s voice so soothing as she guides through this 30 minute fast power yoga flow. I’ve been bringing yoga back into my life and I find my local studio is hit or miss, so I have been playing around with online options and am hoping Jen keeps making more of these videos; they’re wonderful! The Silent Tragedy: Every Parent Who Cares About the Future of His/Her Children Should Read This – If I was a more articulate writer, I could have written this. It certainly goes hand in hand with my personal beliefs and the environment I strive for in our home. 14 Days to a More Efficient Personal AND Professional Life by Katy Widrick – I am so excited to be signed up for this FREE 14 day email course. 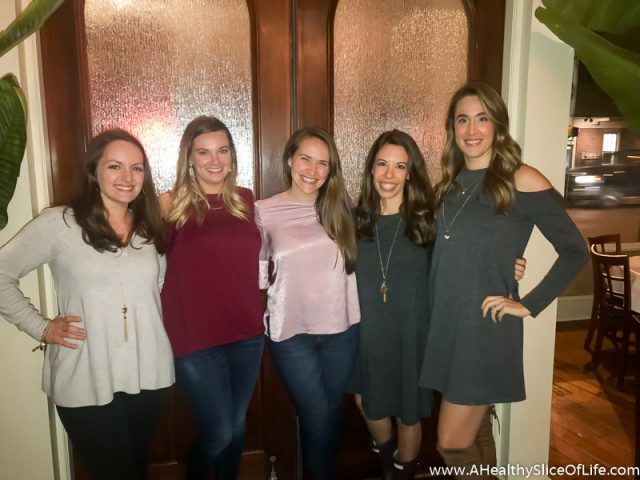 Katy, while keeping it real about how challenging balancing mom life and work life can be, is also a shining example of efficiency done right. I’m eager to soak up her knowledge and apply it to my own life! If you have a favorite plant-based meal or resource, please share it below! Also, have you read any links worth sharing lately? John J. recently posted..Want To Know If Your Love Relationship Will Last Long Term? Answers here! I would really appreciate it if you could talk more about your experience with Thrive Market – specifically what you use it for and how it compares to other online purchasing sites (Amazon). Thanks! Also, snacks for kids (go go squeezes, etc) and chips (blue chips and such) are usually 30%ish cheaper on Thrive too! Hey! A friend sent it to me! I joined the Charlotte group (though I haven’t been to a meeting yet- haha). They meet once a month but have smaller subdivided groups that are more regional (north charlotte, etc). You should definitely check it out! Man – I have to be honest, I like your writing much better than that of the Silent Tragedy link. And I agree with nearly everything it advocates! It just sounds so abrasive and fearmongering – I think most parents are doing the best they can, especially if they’re reading parenting blogs/articles) and ending that article with something like, “We must make changes in our kids’ lives before this entire generation of children will be medicated! It is not too late yet, but soon it will be…” just puts a bad taste in my mouth. Good point, Rachel! I don’t think shaming anyone’s style of doing things ever creates a positive change. I know it just makes me rebel more- haha. I think I am just so intentional in trying to put the suggestions into practice in our home and have seen really positive results when I do (for example, I now leave my phone in a completely different room during homeschool and when I’m playing games with the girls because I found I was not fully present) that I love the ideas that are stressed in the article. I appreciate the feedback so much, especially your kind words in regards to my writing ;)- thank you! I felt the same way–I generally agree with what the article was conveying (and feel that I try to do all of what is suggested) but the tone was not my style and made me not trust her. I love your blog so I find it interesting that you like this woman’s style of writing as I found it upsetting the way she interprets “womanhood”. The “are you winning by a gentle & quiet spirit” made me sad for all of these suffering women and her rec’s to them. That Chicago Tribune article was great! Thanks for sharing. Hi! You should definitely get Minimalist Baker’s cookbook – so great! Her tomato and lentil ragu is a family favorite as is her tomato bisque, pizza burgers, black bean taquitos and more. Also on her website check out her roasted jalapeño vegan queso ( so so good and I have yet to actually do the jalapeño part – just add salsa or green chilies), vegan Mexican cheese three ways, dark chocolate hemp energy balls are a favorite, overnight peanut butter oats, chickpea shakshuka (though that’s more a fall food but still good). I love her food in case you can’t tell lol and I’m not vegan or vegetarian either just try and eat mainly plant based as well. – McDowell park, near Carowinds. Easy car camping, access to flush toilets and showers, and family friendly. – Morrow Mountain, towards Ablemarle. Easy car camping, pool onsite (check opening dates), hiking, and if the girls (and you) aren’t too tired, there’s a drive in movie theater not too far away that’s a fun way to wrap up the night. My kids are older and we’re lucky to make it through the first movie, but it’s still fun and something they don’t get exposed to often. As I recall, they also have flush toilets. I can’t remember about showers, though I *think* they have them, too. I liked these sites when we first started camping with kids because they are so close to home. It was comforting to know if things fell apart, we could come home for the night and go back the next day to pack up. We have never needed to do it, but it was still a nice option for us! We like Bear Den Campground. Family friendly with options to have a tent, rent or bring an rv or cabins. The ‘Silent Tragedy’ article is great! I agree that the tone could come off as slightly negative & abrasive, but as an educator, I agree with SOOOO many of the points she made. I don’t see it as an article that is telling you what you should/should not do as a parent, but merely making recommendations on how to raise better well-adjusted children. In saying that, NO parent is perfect & most parents are sim ply trying their best. But, from my viewpoint, I wish I could print that article & share it with so many of my families. Many of the parents who are on the internet, reading your blog, or even the Chicago Tribune are unfortunately not always the ones who need to read the article & are doing just fine as parents. But I fully fully believe in the rewiring (& poor wiring) of the brain, & how damaging this is to many students in schools these days. Hi Shannon- I really appreciated reading your insight! You’re right on all these points and it made me think of the quote about how if you are worried about how to be a good parent and researching it, you probably are already a really great one!